This project is still being updated! This project is a 2d action platformer developed in the unity3d engine for the April 2017 game design and development Showcase with: U of M, EMU, and LTU. This project is only to be used as a representation of my work for a portfolio and requires a password found on my portfolio. This was my first major attempt at any C sharp coding and also the first time I utilized Unity’s 2D aspects. The character you play can travel left, right, and has a jump and double jump where the height is determined by how long you hold the space button. to stun enemies you must jump and land on their heads this will also propel you higher in the game allowing you to reach unreachable aspects. 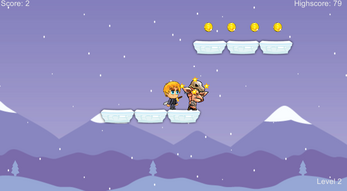 You must avoid spikes and gaps while collecting as many coins as possible to complete the 3 levels created within the two weeks we had to prepare for the Showcase. The game was designed and programmed by myself and the art assets were purchased through the Game Dev Marketplace.